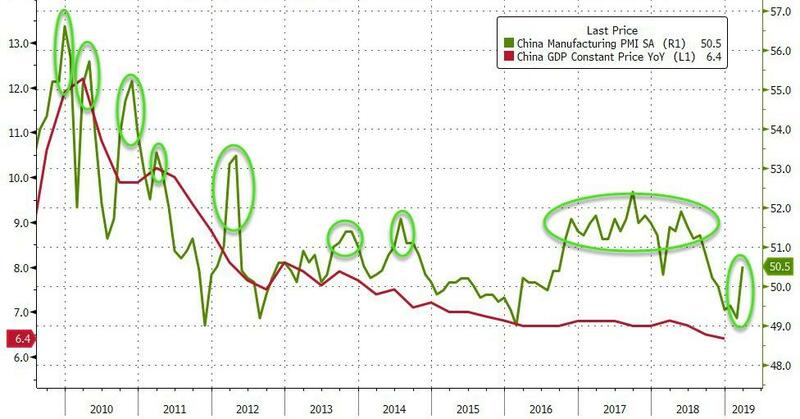 As global stocks soar back towards prior record highs, this time reportedly on the heels of 'green shoots' from China; it is hard not be stunned at the level of cognitive dissonance among the investing public (and their algorithmic partners) who seem capable of cherry-picking the data that supports their asset-gathering and commission-raking narratives... and yet suffer no consequences from the ugly reality that lurks beneath. We have seen a few green shoots before... how's that worked out? 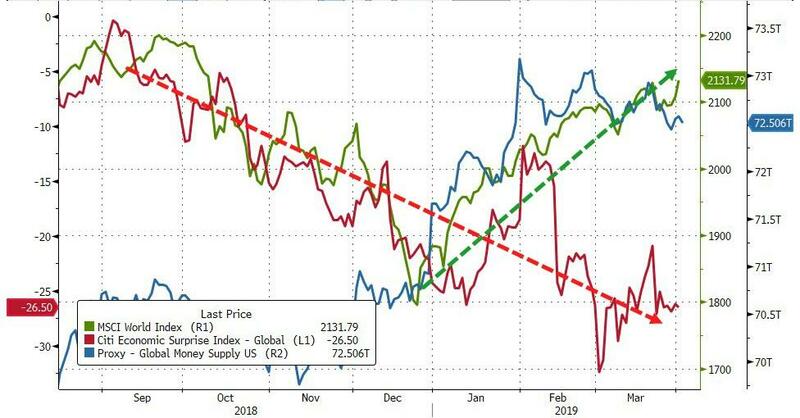 But that doesn't stop the re-creators of history from noting it must be different this time and as former fund manager and FX trader Richard Breslow notes, if all you did was read the contents of my inbox this morning, you would be convinced the world is just fine and about to get finer. Green shoots are popping out all over. Ignore the central banks that, one after another, are being compelled to become more cautious. 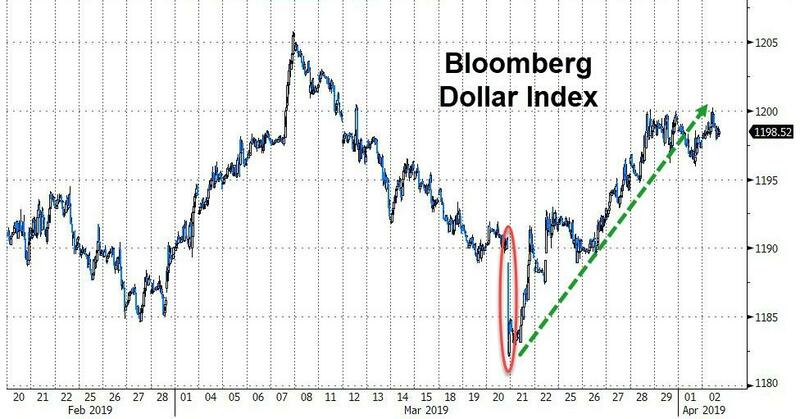 Forget the Eurodollar strip that is nicely green across the board. The second half of the year will float all boats. Trade deals will be struck. Remove those pesky tariffs and all of the, many other, geopolitical issues will fall into line. After all, if Italy can embrace China will anyone else be able to resist? Turkey is in turmoil, but it is way over there somewhere. Besides, contagion risk is so last century. Buy a peso. The U.K. can’t agree on anything. An obvious precursor of a breakthrough and therefore the pound is a screaming buy. It’s probably fortuitous that the overnight economic calendar was so light that analysts could concentrate on honing their forecasts rather than be encumbered with a lot of hard news. This all has the feel of the year-ahead forecasts that are produced after Thanksgiving, rather than a realistic scorecard of what is going on. No one seems at all overly concerned this morning that the CPI miss in South Korea represents the fourth month in a row of falling numbers. Which is worth highlighting because, not only did the result confound economist estimates, falling below even the lowest prediction, but is at odds with what the BOK has been optimistically expecting. No matter, it’s still being described as “temporary” in the commentaries. This number followed weak export numbers the day before and on both days the Kospi Index rose. That’s central bank, not animal, spirits. The dollar is going down has been a ubiquitous theme. The reasons given cover an amusingly wide range of causes. But being angry with the U.S. isn’t a great trading thesis. It’s hard for a trader to watch short dollar recommendations getting serially stopped out and accept this as a mere head fake, not to be taken advantage of. Look at the price action so far this year. The dollar is begging to be traded, not bet on with a stubborn big picture view. The Bloomberg Dollar Index printed a three-week high today. It is back to being right up against resistance making this a good time to watch it carefully. Whatever it does from here, including staying put, will be usefully telling. A lot of people have been citing the COFER data as a reason to be bearish. Reserve managers have been lightening up on the dollar. It is an important data point. Ultimately it might matter. But it’s not something all that useful for immediate positioning. If you knew this data in advance and traded from the short-side in the fourth quarter, you would have ended up sad. Investors more than compensated for the official sales. What does that tell you about perceived relative attractiveness and the need for safety? The dollar isn’t just another currency and can’t be analyzed as if it is. One day it will have company. But not yet. 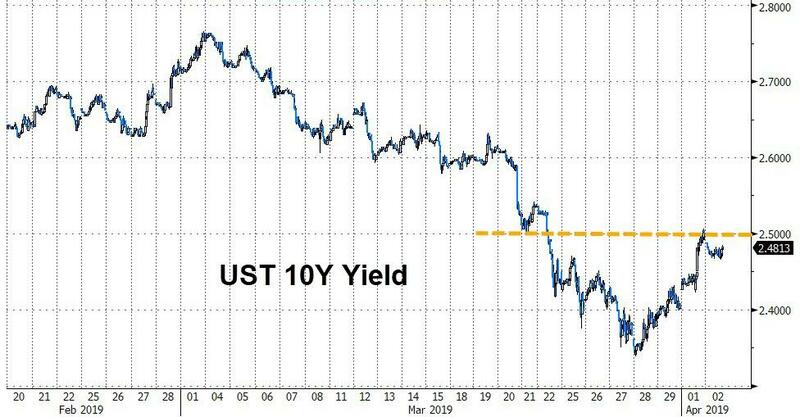 As far as bonds are concerned, Monday’s foray by the 10-year Treasury yield back above 2.50% ran into large-volume bond buying as soon as the cash market opened.